It will be 5 more months before the new lift in University Corner is operational. Photo: Andries Sibanyoni. The problem of faulty and sometimes dysfunctional elevators at the Wits University Corner Building is far from over. Staff, students and tenants will continue to experience the inconvenience of dysfunctional lifts for at least another year. According to Dirk Vanden Eynde, Project Manager at Wits Campus Development and Planning, work to install new lifts began in the middle of last month. The installation of the first lift which is already decommissioned is expected to take about 5 months to complete. Work on the second lift will start after the new one is operational. The project has been structured to ensure that all work takes place inside the existing lift shafts and that there are no disturbances to the daily operation of the building and staff. 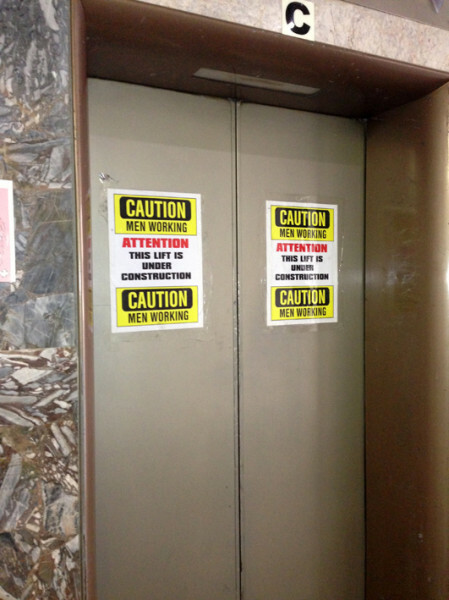 Marcus Toerien, a Masters student at Wits Journalism and a regular user of these lifts complained that he has been coming into the building for the past four years and the situation has not improved. “More often than not we become frustrated and we have to walk up the stairs …we do not get clear time lines as to when things will be normalised as there is no open communication between those responsible for this building and the people who use the building,” says Toerien. He emphasised that there are people who have to walk up and down the University Corner building (a 20 floor building) and it is difficult for them. Another student, Mbongeni Mbingo explained that his experience with the lift situation has been frightening as the buttons on lifts are simply not working properly. “My experience has not been good and it’s sort of frightening when you are in there alone and the lift cannot stop at a selected floor,” says Mbingo. But, he added jokingly that the stairs on the other hand are good for fitness, but felt sorry for people going to the 20th floor using the stairs.